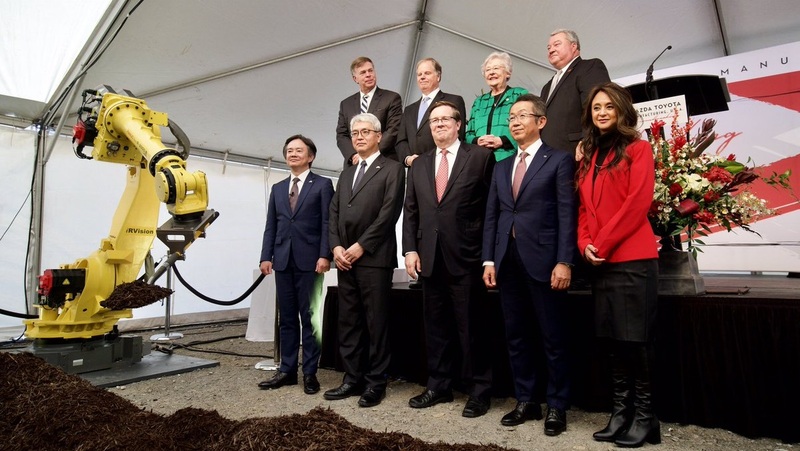 With help from a robot, the first shovel of dirt was turned today at a sprawling site that will be home to Alabama’s next auto assembly plant – a $1.6 billion facility being built by Mazda Toyota Manufacturing USA that will produce 300,000 vehicles annually, beginning in 2021. The jointly owned-and-operated automotive production plant in the Limestone County portion of Huntsville is expected to create 4,000 jobs and accelerate growth in Alabama’s auto sector. Executives of Mazda and Toyota joined Gov. 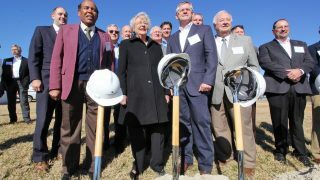 Kay Ivey, U.S. Sen. Doug Jones and local officials at a groundbreaking ceremony to mark the official start of construction at the 2,000-acre site. At the end of the ceremony, an industrial robot armed with a shovel plunged the blade into a patch of dirt and raised it while “Sweet Home Alabama” played. 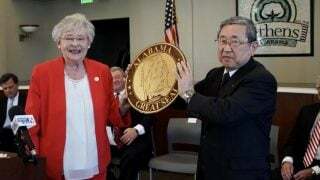 Mazda, Toyota break ground on Alabama’s fourth auto manufacturing plant from Alabama NewsCenter on Vimeo. The new assembly plant will produce the next-generation Toyota Corolla, which debuted Thursday in California, and a yet-to-be-revealed Mazda crossover model. The facility is just miles away from a Toyota engine plant that employs 1,400 people and produces more than 700,000 engines annually. The automaker has invested nearly $1 billion in the Huntsville plant, after repeated expansions. “It is extremely special to have a partner like Mazda to team up with not only to make the highest-quality cars, but also to create a plant that team members are proud to call their own,” said Jim Lentz, CEO of Toyota Motor North America. “As we’ve seen at our Huntsville engine plant, Alabamians are a proud, talented, hard-working group. We are excited to continue our deep investment in the U.S. and Alabama and see nothing but a bright future,” he added. The investment in the new assembly plant is being split evenly between the automakers. They say the alliance will assure competitiveness in manufacturing, allowing both automakers to respond quickly to market changes and helping to ensure sustainable growth. Ivey welcomed the Mazda-Toyota partnership to Alabama’s growing automotive manufacturing sector. 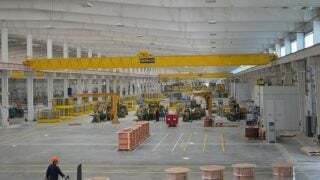 Jobs at the new plant will pay annual salaries averaging $50,000. “Not only is Mazda Toyota Manufacturing providing high-paying jobs, they are investing heavily in our future workforce. This will not only benefit them, but also other manufacturers in the area,” Ivey said. “The Mazda Toyota Manufacturing USA facility will power a new phase of growth for Alabama’s auto industry by acting as a magnet for substantial new investment and job creation,” said Greg Canfield, secretary of the Alabama Department of Commerce. “We’re excited about this project because it positions us to build a new partnership with an innovative manufacturer in Mazda and deepen our established ties to an old friend in Toyota,” he said. The Mazda-Toyota team selected the site in Huntsville after an intensive nationwide search that included visits to 20 states in a six-week period in 2017. Climaxing what was codenamed “Project New World,” the automakers announced their decision on Jan. 10, 2018, at a ceremony in Montgomery. As part of today’s groundbreaking, Mazda Toyota Manufacturing donated $750,000 to support STEM-related programs that will encourage and motivate students to pursue a career in the advanced manufacturing field. With 4,000 jobs to fill, the automakers say they are committed to investing in developing the plant’s future workforce in collaboration with local educators and economic development partners. The donation includes $500,000 to the Huntsville Madison Chamber Foundation to launch a career exploration online platform that will help highlight careers in manufacturing to students, build skills and connect job seekers to opportunities. They also gave $250,000 to be split among six school districts in Madison, Limestone and Morgan counties to advance STEM or career technical programs that align with advanced manufacturing. Huntsville Mayor Tommy Battle said his city has a rich history in space and defense, with continued growth and advanced research at NASA’s Marshall Space Flight Center and its many contractors. With the presence of Mazda Toyota Manufacturing USA, along with Polaris and others, Huntsville is building a broader reputation in mobility. He added that the ceremony marks one of the greatest days in the city’s history. “Today is the day we put a shovel in the ground on Huntsville’s growth into the auto industry,” he said. State Sen. Arthur Orr (R-Decatur) said the Mazda Toyota facility will have a massive economic impact on the region. “I truly believe that the area does not realize the magnitude of what this project will bring and how the influx will not be a ripple but a wave of economic impacts across North Alabama,” he said.